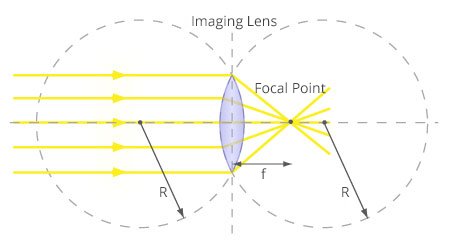 Aperture: The total light-receiving area of the lens is called its aperture . The larger the aperture, the greater the amount of light received by the lens from each point in the scene, and hence the brighter the image. The size of the aperture (opening) can be controlled using a manually adjustable diaphragm, or iris, which is placed right next to the lens. This enables us to increase the aperture size when photographing dark objects, and make the aperture smaller when photographing very bright objects. The iris of a camera lens therefore serves the same purpose as the iris of the human eye. Use the buttons in Figure 10 to see how the iris of a lens works. Thicker lenses with a shorter radius of curvature R have a shorter focal length, while thinner lenses with a longer radius of curvature R have a longer focal length. The focal length is the most important property of a lens and it determines where exactly the image is formed. "Aperture" Wikipedia, The Free Encyclopedia. Sept 12, 2012. [Online]. Available: http://en.wikipedia.org/wiki/Aperture. "Focal Length," Wikipedia, The Free Encyclopedia. Aug 3, 2012. [Online]. Available: http://en.wikipedia.org/wiki/Focal_length. E. Hecht, Optics. Addison Wesley, 2001.